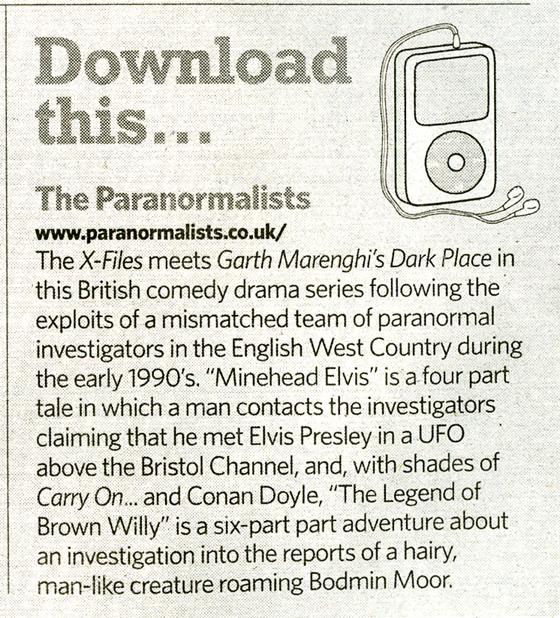 Hear the Paranormalists writers interviewed on BBC Radio 5 Live "Pods and Blogs" click to hear interview. Please help us by taking our survey (Click Below). The 20th century turns the corner and enters the last lap of its spectacular journey and the second millennium of human history enters its last decade: the doom-mongers and nay-sayers are widely predicting the end of the world. And the Spice Girls enter the pop charts. An intrepid band of paranormal investigators in a sleepy English town wake up to an unprecedented flurry of thaumaturgic activity...The year was 1993, the place was Minehead in West Somerset and they were The Paranormalists. The team was started by school friends Hitchard Screening and Murray Black in 1982 after Hitch's father, an RAF pilot, disappeared on a routine mission over the Bristol Channel. Enlisting the help of his only friend Hitch vowed to devote his life to the exploration of the paranormal and Murray, in the mistaken belief that it would impress girls, agreed to help. The pair were later joined by Linda Fortune, a former child prodigy who had graduated with honors from a correspondence course degree in cryptozoology aged 9 and spent her teens and early twenties accruing knowledge in every field of the paranormal. Linda also brought along her younger brother, Pete Fortune, an electronics whizz possessed of extraordinary psychic ability. Together they were the Paranormalists and together they vowed to find the truth. The adventures of The Paranormalists have been adapted for podcast. The of the first of these "Minehead Elvis" (in 4 parts) is available now... Episode 2 "The Legend of Brown Willy" is now complete. We're currently working on Episode 3 "The Holy Grail". And please Pop us at PopCurrent.com! The only surviving picture of Clive Tagish (left). Click photo to enlarge. Tulip, the fresian with the religious simulacra. Click photo for more. Holiday makers on Minehead Beach... Could that be "Brown WIlly" in the background? The great Michael Cronin, TV and theatre stalwart, known to a generation as Grange Hill's "Bullet" Baxter, joins an all professiopnal cast as the mysterious Plutarch Black. Click here for full cast list.